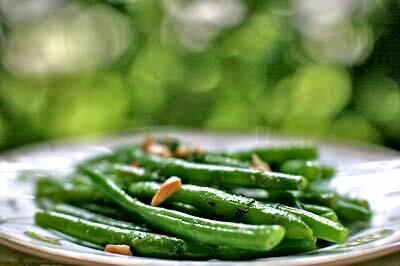 Cook the green beans in a large pot of boiling salted water until just crisp-tender, about 5 minutes. Drain the beans and transfer them to a large bowl of ice water, cooling them completely. (The ice water will shock the beans into a vibrant green color.) Drain the beans well. At this point you can make the beans a day ahead and store in refrigerator. Alternatively you can steam the beans for 5 minutes and proceed directly to the skillet. 2 Melt the butter in a large, heavy skillet over medium high heat. Whisk in half of the fresh thyme (1 Tbsp), the Dijon mustard and garlic salt into the butter. Add the beans to the skillet and toss until heated through, about 4 minutes. Transfer to a serving bowl. Sprinkle with toasted almonds and the remaining 1 Tbsp of thyme. Click here to view the Healthy Cooking video for this recipe.